Mercedes-Benz automobiles are long known as an obvious choice for enthusiasts that appreciate a high level of craftsmanship and demand reliable service. With an unrivaled history that includes the famed pre-war White Knights and the dominant Silver Arrows, these cleverly engineered products from the world’s oldest automaker continue to make a solid case for buyers. 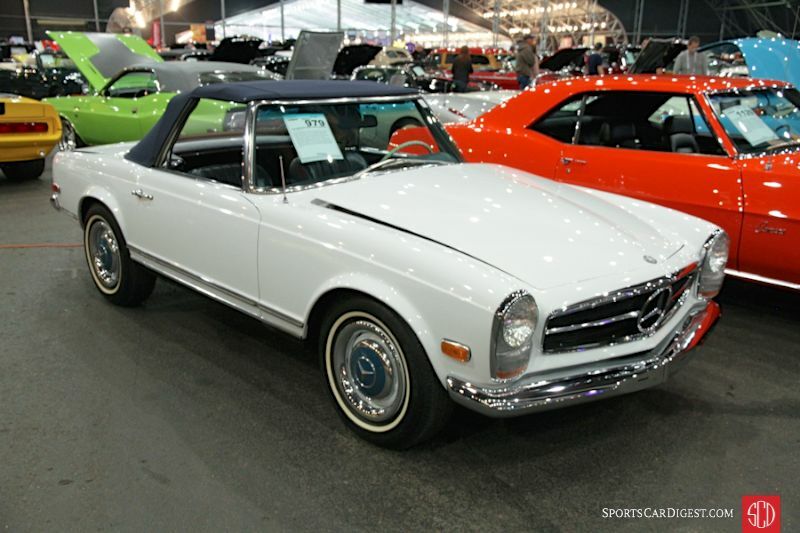 Lot # 0979 1968 Mercedes-Benz 250SL Convertible; S/N 11304312004720; White/Blue vinyl; Dark Blue cloth top; Cosmetic restoration, 2- condition; No Reserve; Hammered Sold at $50,000 plus commission of 10.00%; Final Price $55,000 – 4-speed, two tops, white steel wheels with hub caps and trim rings, store brand all season narrow whitewalls, Blaupunkt AM/FM radio, VDO dash clock. – A few tiny cracks around the hood but otherwise very good paint and chrome. Near perfect newer soft top. Wood console is original and a bit dry and both the steering wheel rim and cap have numerous cracks, but the rest of the interior is very good with likely newer seats and carpets. Very clean but not highly detailed underneath. A car that’s gotten cosmetic attention that left it a shiny museum piece, but never fully done over. On display at a museum in China from 2006-2015. – Reported sold by Barrett-Jackson in Las Vegas last year for $49,500. 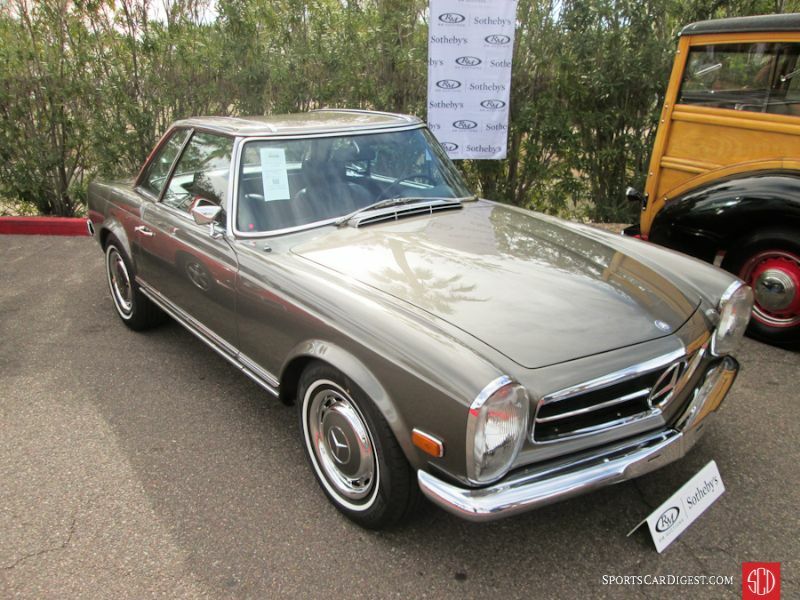 That result, even for a flawed 250 Pagoda, was downright cheap, and the one here in Scottsdale is still quite a bargain. 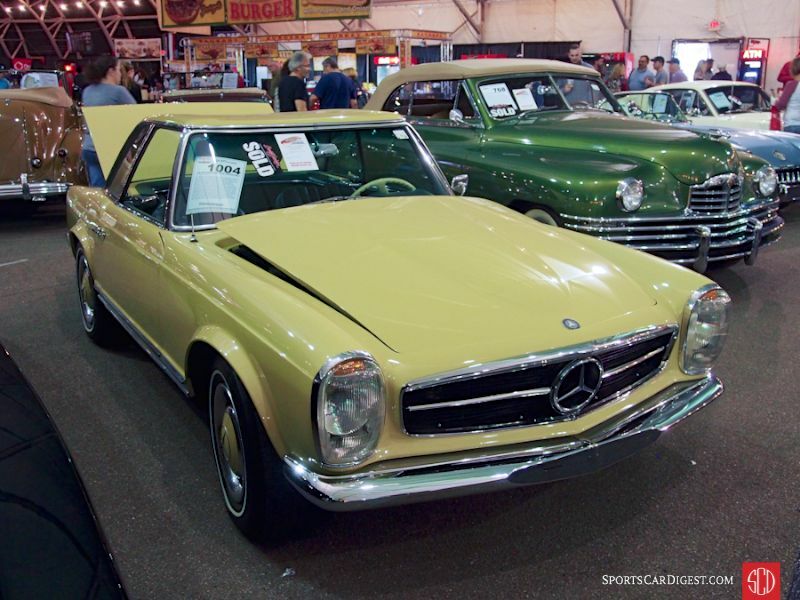 Lot # 1004 1967 Mercedes-Benz 230SL Convertible; S/N 11304210015913; Light Yellow, Light Yellow hardtop/Green leatherette; Black top; Visually maintained, largely original, 3 condition; No Reserve; Hammered Sold at $45,000 plus commission of 10.00%; Final Price $49,500 – 4-speed, two tops, Blaupunkt multiband radio, body color accented hubcaps, trim rings on green steel wheels. – Repainted assembled with erratic masking and areas of light orange peel. Engine compartment has been given a pressure washer detailing and has rusty brackets. Good original interior with impressively sharp dash and gauges. Peeling old undercoat in the wheelwells. A superficial cosmetic redo of a basically sound and well preserved SL. – This combination of manual transmission, both tops and decent presentation could have brought more as the 113-series floats upward toward softening 190SL values. The underhood presentation is appealingly original, if aging, as is the original interior. All things considered the WestWorld bidders sensibly restrained their enthusiasm with a result that this price is fair to both the buyer and the seller. 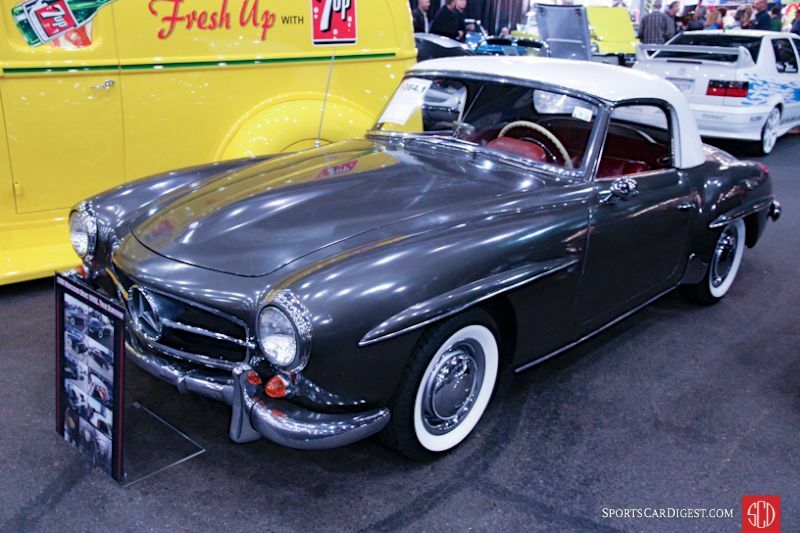 Lot # 1084.1 1956 Mercedes-Benz 190SL Convertible; S/N 1210426500100; Gray, White hardtop/Red; White top; Unrestored original, 4+ condition; No Reserve; Hammered Sold at $85,000 plus commission of 10.00%; Final Price $93,500 – Dual Webers, white hard top, hub caps and trim rings, whitewall radials, wood shift knob, Becker Europa radio, VDO dash clock. – All original with major mechanical repairs. Rebuilt motor. New brakes, tires, both tops and exhaust. Cracked, ripped original seat upholstery. No carpets. Dull but charming original paint with just the right amount of scratches and chips. Cracked whitewalls. Dry, clean and complete underneath. With the mechanical overhaul, it’s usable as it sits, although the serious rips in the seats are unfortunate. – A premium for originality was paid for this car, but it was not excessive (at least as premiums for tired, dirty cars were going in Scottsdale) and the seller endured the time and expense of getting it running and drivable again, so this was a relatively sound buy, at least as far as 190SLs are concerned, and $19,250 more than the non-running 190SL in even dirtier condition at Gooding’s Scottsdale auction. The Webers are not correct, however, and a set of rebuilt Solexes would be a good investment. 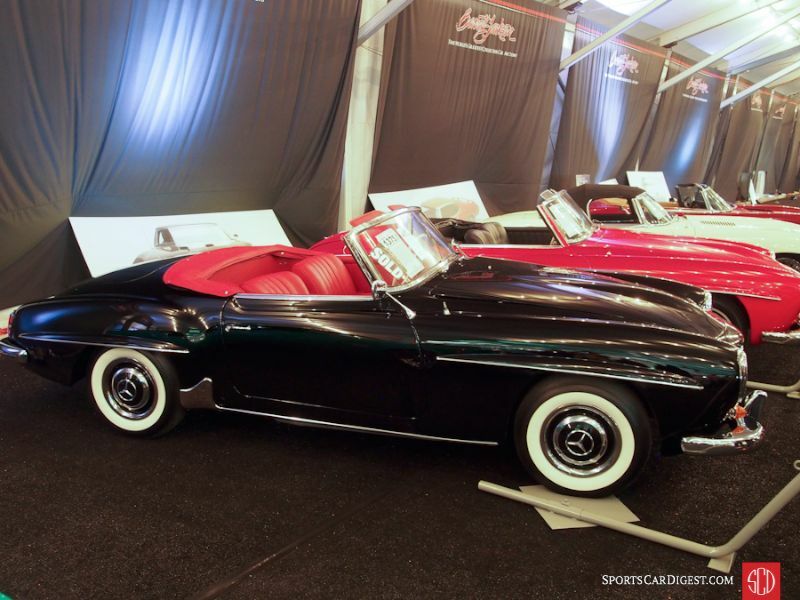 Lot # 1375.1 1963 Mercedes-Benz 190SL Roadster; S/N 24539; Black, Black hardtop/Red leather; Black cloth top; Cosmetic restoration, 3+ condition; No Reserve; Hammered Sold at $130,000 plus commission of 10.00%; Final Price $143,000 – Becker ‘High Fidelity’ radio, body color wheels, hubcaps, trim rings, whitewall tires, dual outside mirrors, two tops. – Very good paint, chrome and upholstery. Sharp engine compartment. Underbody painted assembled over old, peeling undercoat. Thin windshield frame and window sill chrome. – This 190SL’s restoration isn’t as good, or as thorough, as the price it brought indicates. Even with both tops it is an expensive 190SL as their prices slide slowly back to earth. 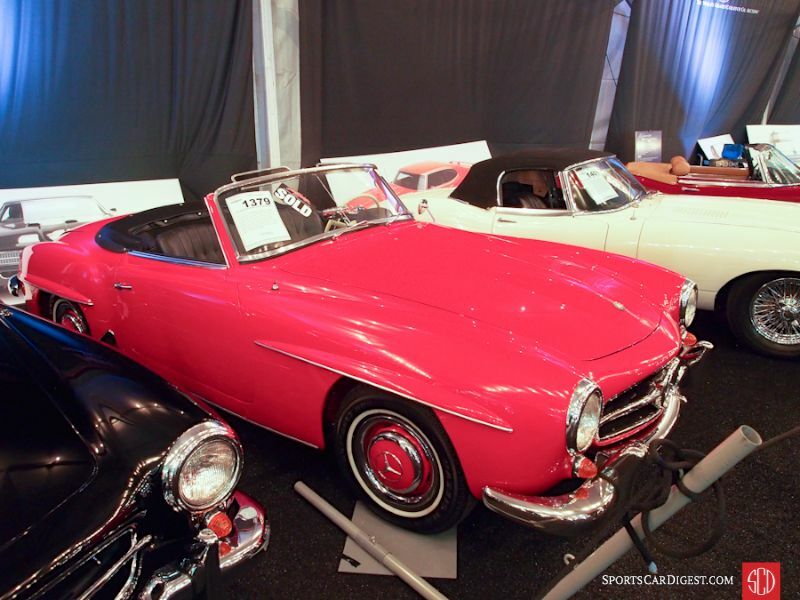 Lot # 1379 1958 Mercedes-Benz 190SL Convertible; S/N 1210428500718; Red/Black vinyl; Black cloth top; Visually maintained, largely original, 3- condition; No Reserve; Hammered Sold at $120,000 plus commission of 10.00%; Final Price $132,000 – Blaupunkt multiband radio, body color wheels, hubcaps, trim rings, narrow whitewalls, two tops. – Repainted over old paint with shrinkage cracks all across the cowl. Thin windshield frame chrome, along windowsills and on interior handles. Wheel wells repainted over old, peeling undercoat. An auction car. – Represented as 39,062 miles and stored for 36 years, this 190SL was rushed through a superficial cosmetic restoration to catch the 190SL wave. While the wave is subsiding this car caught just enough of it to achieve a strong result, one that is better than its presentation. 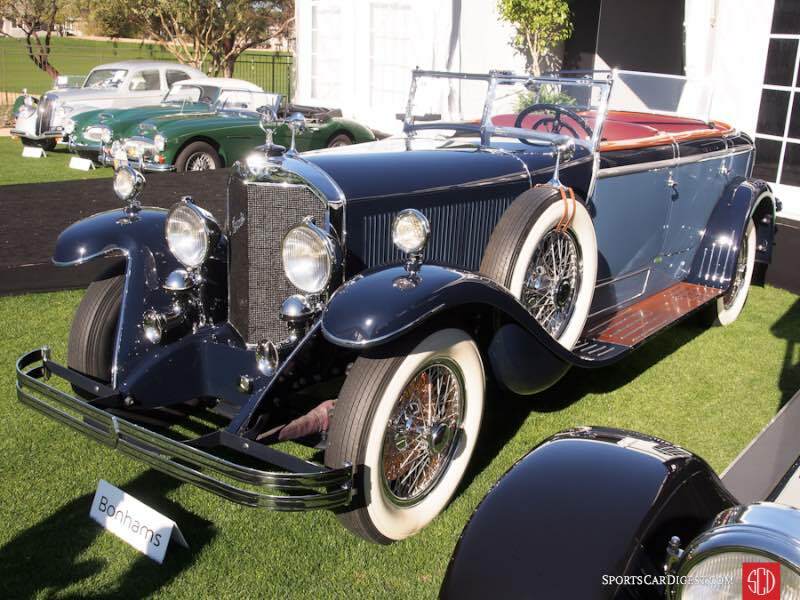 Lot # 34 1928 Mercedes-Benz 630K Transformable La Baule, Body by Saoutchik; S/N 35813; Engine # 60793; Dark Blue, Blue/Burgundy leather, moiré cloth; Tan cloth top; Estimate $1,000,000 – $1,300,000; Concours restoration, 1- condition; With Reserve; Hammered Sold at $885,000 plus commission of 10.00%; Final Price $973,500 – Chrome wire wheels, wide whitewalls, copper brake drums dual windshields, dual sidemounts with mirrors, opening vee windshield, Bosch headlights. – No known history after the chassis was delivered by M-B to Saoutchik in 1928 until well into the last half of the 20th century. Excellent older paint and cosmetics. Body wood trim is heavily varnished and starting to craze. Underbody and engine are nearly concours quality. The interior with its moiré cloth inserts, like the endpapers of a fine book, is gorgeous. About as close to concours as an old restoration can be. – Very special and elegantly appointed but bulky disappearing top coachwork attracts attention and is typical of most 630Ks, which would need all the horses of the supercharged 6.3 liter six to haul it around. The lack of history or provenance is disappointing, and more than a little unsettling, for such an epic automobile and the gaping hole in its history makes the buyer’s decision to pay this much a tribute to the appeal and allure of the chassis and drivetrain. 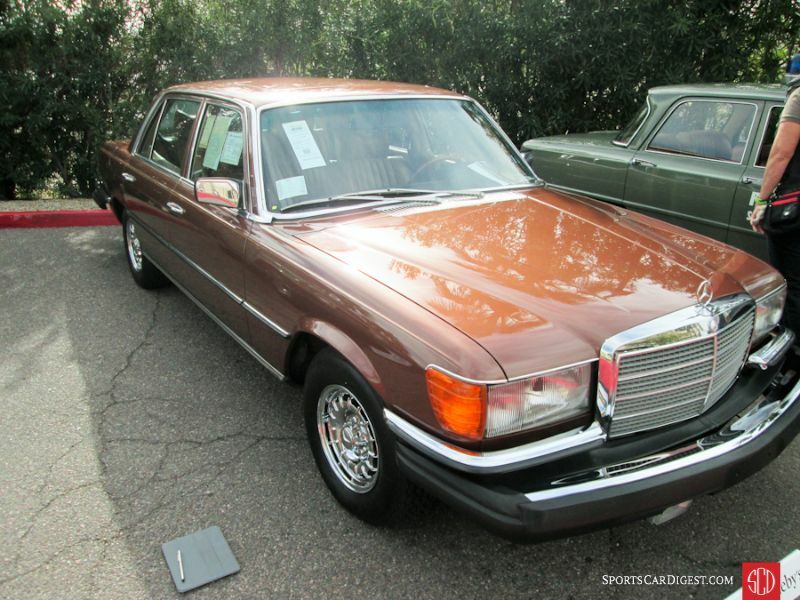 Lot # 204 1979 Mercedes-Benz 450SEL 6.9 4-Dr. Sedan; S/N 11603612006349; Milan Brown Metallic/Bamboo leather; Estimate $60,000 – $80,000; Unrestored original, 2+ condition; No Reserve; Hammered Sold at $55,000 plus commission of 10.00%; Final Price $60,500. – Bosch K-Jetronic fuel injection, alloy wheels, Euro headlights, air suspension, aftermarket Nardi woodrim steering wheel, cassette stereo, front and rear headrests, window sticker and delivery documents included. – Excellent panel gaps and factory paint is hardly aged. Glass and trim are like new. The engine is very clean and the interior is like new. In better condition than a two year old used car and showing 30,015 miles. – This remarkably well preserved 6.9 is still capable of surprising alacrity and doing so with comfort and security. Its brown livery reflects the subdued tenor of the late Seventies. It brought a reasonable price here with a realistic premium for its originality. Lot # 215 1968 Mercedes-Benz 280SL Roadster; S/N 11304412006311; Engine # 13098310002908; Anthracite Grey Metallic/Dark Gray; Estimate $150,000 – $180,000; Older restoration, 3+ condition; No Reserve; Hammered Sold at $105,000 plus commission of 10.00%; Final Price $115,500. – Automatic, narrow whitewall tires, Becker Mexico radio, factory air conditioning, hardtop. – Smooth panels with factory gaps. Excellent paint. The front bumper has been repaired at some point and the grille is a bit wavy. The engine has been detailed, but not restored, with a few incorrect finishes. The interior has been well restored decently although the seats were overstuffed. Full restoration completed in 1990 for a Japanese collector. A good looking car overall but falls down on correctness. – One of two Pagodas in the sale, this car brought a huge result considering its good but unexceptional condition. The factory air conditioning adds to the value, but that doesn’t explain the over-market result here.